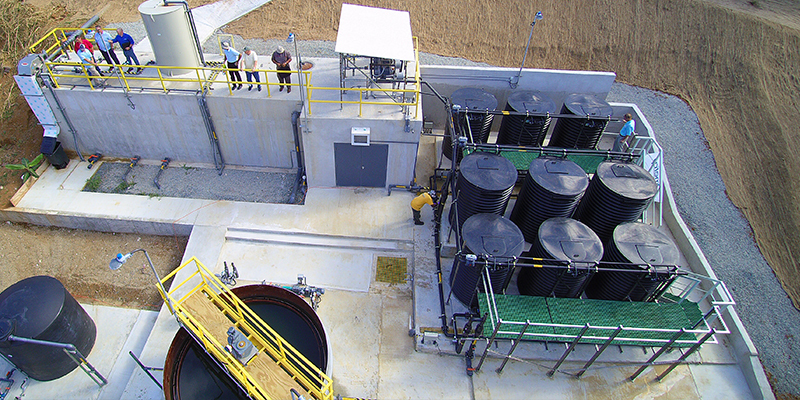 The wastewater treatment plant, with a 25,000 GPD capacity, uses two stages of MABR modules. St. Thomas in the U.S. Virgin Islands is considered one of the most beautiful sites in the Caribbean. Being an island affects the natural water supply, and water shortages have an impact on irrigation for local farmers, domestic use, and tourism. The Bordeaux plant in St. Thomas is a localized municipal wastewater treatment plant, designed to serve a population of approximately 200 houses. The Bordeaux region of St. Thomas had a pressing need for a wastewater treatment plant that produced high-quality effluent. Its existing plant was old and didn’t meet regulations or industry standards. The Virgin Islands Waste Management Authority (VIWMA) was looking for a solution that could treat current and future sewage flow and produce high-quality effluent that could be discharged into the environment in the Bordeaux area or be used as reclaim water for agriculture irrigation in the future. The plant has been operating since December 2016, producing excellent effluent quality.